To say that Blackboard's learning management system has undergone some major changes in recent years is an understatement. The version of the product that Education Dive saw at this year's EDUcause conference, for example, is leaps and bounds beyond what we remember using in the early '00s. In fact, it's the product we wish had been available to us back then. The Washington, D.C., enterprise ed-tech company's signature product, Blackboard Learn, has seen new features ranging from a more user-friendly interface to a My Blackboard, which presents information in a format more akin to a social networking site. These changes are the work of Blackboard's user experience team. Formed in 2006, the UX team is made up of researchers, designers and developers tasked with using direct feedback from instructors and students, understanding their needs and what they do on a daily basis, and figuring out how to actually translate that into the technology. In simpler terms, the team works to, as UX Vice President Stephanie Weeks puts it, "identify an elegant solution to a problem and make that come to life in technology." They are the people behind Blackboard's ever-improving products. It all starts with the research, and the UX team brought a shift in the company's philosophy toward both research and design. In the last few years, the model has shifted from building and then validating to incorporating feedback throughout the development cycle. Long-form usability studies near the end of feature development were phased out in favor of small, iterative research projects during all stages of a build. Even the users the company talked to changed dramatically. UX Director of Operations Andy Jacobson, who helps facilitate the team's work by helping them reach out to users, tells us that just a few years ago, the people the company talked to would have been 90% system administrators, Blackboard's main points of contact on campuses. Working through those administrators, the company made an effort to gather direct feedback from students and teachers, who now make up around two-thirds of its feedback. "The thing that I think is unique about Blackboard, compared to other software companies," extols Jacobson, "is the passion and the willingness of our user base to engage with us during development. They really care. They want to be part of the process." A huge component in Blackboard's research process is the Blackboard Idea Exchange, a group of more than 1,200 clients who sign nondisclosure agreements with the company and participate in various activities throughout development. "We’re able to send out activities to them pretty much immediately and know that they’re going to turn it around and get us good responses for that," says Jacobson. "Really, the strength of the research that we do that goes into the design is really that user base. They’re fantastic." These activities utilized by the company range from 3- or 4-question surveys to affinity diagramming, which eliminates outlier ideas in favor of what's most important to participants, and Kano modeling, an investment vs. satisfaction model that visualizes how users react to features or functions. A smaller group from Blackboard's product development partnerships — the people on designers' rolodexes, Jacobson notes — engage with the team on a monthly basis, participating in focus groups and other activities. And Blackboard World, an annual conference for users, has become a place to gather data, enlist new members of the BIE, and show off research. Of course, more research also means more campus visits, and the company is certainly taking advantage of its proximity to schools like Georgetown and Shenandoah when it comes to getting designers and other product development members face-time with students and faculty. The research isn't the best part of these interactions, though, Jacobson insists. It's the moments where a faculty member explains to a designer what they want to do with Blackboard, and "you see both of the light bulbs go off." "Those interactions go into everything," says Jacobson. "They go into new designs. They go into building personas for people. It’s just great. I just love those moments." It's easy to think of research as a stuffy and ultra-serious thing, but Blackboard injects a healthy does of fun into its Mt. Vernon Square office space. Instead of the typical name plates outside of offices, a portion of the windows next to individual doors are replaced with blackboards, upon which employee's names are drawn in chalk — or at least made to look that way. Much more noticeable, however, are the other elements of the decor. The moose is the UX team's mascot and got his start when one of the UX team's creative directors wanted to liven up the office. 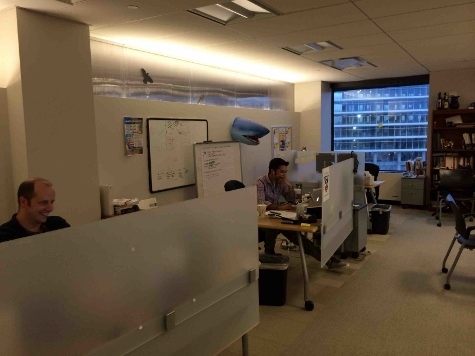 With him came an array of other inflatable animal heads and goofy objects, such as the ice cream cone lamp that Jacobson once had on his desk. But the moose, he was different. One of the designers began tweeting as "UX Moose," and some of Blackboard's users began following. 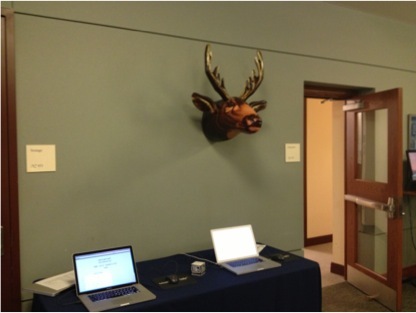 The moose soon became a marketing tool for the company's research activities, hanging outside of rooms at Blackboard World to let users know they can participate in research there, or on a wall at a campus visit as a conversation starter. "When you hang an inflatable moose head in the MBA program at Georgetown, people come by and ask you, 'Why do you have this moose here?'" says Jacobson. "And then you say, 'Hey, we’re doing a little research. Would you give us five minutes and participate in this?'" Word has it Shenandoah even adopted the moose as its own support mascot. 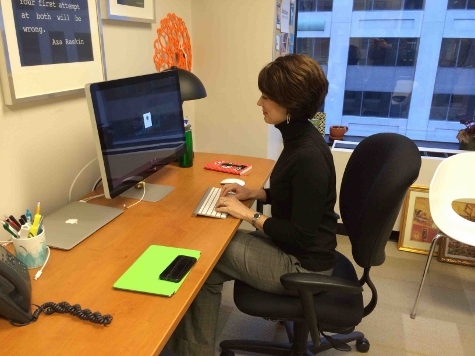 Design Strategist Joanna Hunt joined Blackboard seven years ago, not too long before the user experience team really picked up steam. Hunt previously worked on the other side of the spectrum, supporting teachers using Blackboard at Seneca College in Toronto, Canada. She was there from the first day of their Blackboard installation, during which time the school went from wanting to put some courses online to being fully mission critical in four years. "When the user experience team was created, we were given a slightly different type of focus — instead of just being focused on the broad market, actually being able to focus on the people who are going to use the software on a daily basis. For me, that was a really exciting change because I had come into the organization from the other side," says Hunt. "It really makes a big difference to the success of those users when there are people who are thinking about that right from the very beginning of the process. Not to say that Blackboard wasn’t doing that before, but they didn’t have a group of people where it was the primary responsibility. Changing the culture so that focus on the people came first was very exciting for me." Thanks to the experience from her previous role, she was able to easily make the shift from dealing with one school and one set of teachers to 200 schools and 200 sets of teachers. Typically, the design team is tasked by product management to come up with solutions for market problems — by talking to customers and studying the competition and similar interactions in other tools, regardless of whether those tolls ultimately relate to what Blackboard's software actually does. Their research is meant to help them understand the problem and what the user is wanting to do. The notes the design team gathers and the conversations it has with customers are translated into sketches and conceptual screenshots, which are then used for focus groups and more conversations with clients. The goal is to find out if customers would find, for example, certain pieces of information valuable if they could be presented, or what pieces of a design do or don't make sense. Sometimes, more sketches are drawn during the conversations, illustrating different ways the information can be visualized. Ultimately, the final solution attempts to address the needs of all customers based on these interactions. "We spend a lot of time trying to understand what that is all about," says Hunt. "What are they really trying to do? Four people will describe the same task in four different ways and think that they all do it totally differently, but at the end of the day, they’re really trying to get at that same thing. And that’s a key component of what our role as a designer is about —​ being able to make those translations and make those leaps from person A, person B, and person C all talking about one problem, to getting to something that meets the needs for all of them." Flow charts and workflow diagrams are ultimately presented with the designs to development teams, who then have to understand the problem being solved themselves before figuring out how to build the solution. The design team, Hunt explains, sits between user expectations and developer expectation, attempting to make the translations between both. "we do a lot of back and forth and a lot of translation between those two roles, going from very layperson descriptions to very technical descriptions — even on the same feature at some point." Ultimately, the team has a screenshot of a real product, with its fair share of user testing and validation and tweaking behind it. This is once again presented to teachers for the purpose of figuring out the right language (e.g. "monitor" versus "watch"), so the final tool most closely matches the way teachers talk and think about its functions. Those functions come into play, as well. When Blackboard reworked the messaging system in its retention center, one thing instructors really wanted was the ability to view all messages they had sent to a student, and a way to keep notes about conversations with particular students. Through talking to teachers, the UX team was able to map out a workflow that made that feature hit the mark it needed to. "Our role with customers is to make sure that what we do is simple and easy, and that they can understand it without a great deal of explanation," says Hunt. "I like to put a screen in front of them and say, 'What do you think this does?' and me not tell them anything. If they can understand 80% of it, we’ve done really, really, really well. If they can’t, then we talk about it and we work through what would make it easier to understand, and what is it that’s confusing. So we spend quite a bit of time putting this type of stuff up in front of customers." Of course, during this process, UX VP Stephanie Weeks is meeting with the designers to offer additional guidance or help simplify ideas even further. And when she's not doing that, she's meeting with customers and listening to their ideas or problems. "Those are some of my favorite conversations because we learn a lot from our customers," says Weeks. Ultimately, the User Experience team is indicative of the growth Blackboard has seen over the last 16 years. With a full-time team tasked with thinking about nothing but design — something the company didn't have early on — there's more time spent making sure what teachers and students want is truly addressed. "We’re trying to bring our own ideas about education and match them with the people who are out there really doing all of this every single day, and making the best of that come to life," says Weeks. "That’s what we’re focused on today. That’s what makes it better, I think, is working with our customers." The changing face of education naturally made some of these changes necessary, as well. After all, phrases like "online education" now mean more than just throwing some documents online, and companies like Blackboard would have had to adjust for these developments accordingly with or without a user experience focus. The difference, however, is that simply adjusting for the market wouldn't result in the leaps and bounds of improvement Blackboard has made in the last several years — it comes from the type of dedication to what matters most to instructors and students shown by the UX team. "Do we enable people to get the education they need and to teach one another to do big important things in the world? That’s what’s exciting to me," says Weeks. "The LMS is a very small piece of that, so we’re looking to make sure that people have all of the base that they need, but really get that connection and that enablement and that insight that they need to do bigger, better things." Would you like to see more education news like this in your inbox on a daily basis? Subscribe to our Education Dive email newsletter! You may also want to read Education Dive's look at 6 ways government could impact education in 2014.